The President of Nigeria today participated in the ward congress of his party, the All Progressives Congress which took place in different party wards in the country. 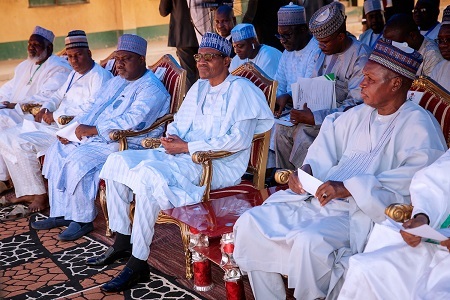 President Muhammadu Buhari today, 5th of May, 2018 participated in the All Progressives Congress ward congress at Sarkin Yara A Ward of Daura Local Government Area of Katsina State. He was joined by Katsina State Governor Rt. Hon. Aminu Bello Masari, APC Chairman in the state, Mallam Shittu S. Shittu, Members House of Rep. for Daura, Sandamu and Maiadua Hon. Sani Saidu and Chairman Stakeholders Alhaji Sani Abubakar. 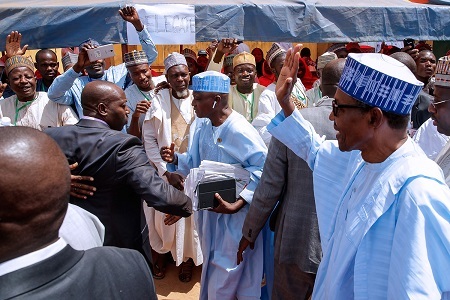 Speaking at the All Progressives Party's (APC) Ward Congress held at Bayagida Model Primary School, President Buhari said the passion to serve and see real changes in the lives of Nigerians informed his choice to join partisan politics in the first place, and inspired him to contest elections in 2003, 2007, 2011 and 2015. The President said that his decision to seek a second term in office was borne out of a deep passion to serve Nigerians, and not for personal gains. President Buhari noted that his administration had already started the process of ensuring fairness, justice and equity, in spite of challenges, and would work hard to consolidate on the gains. “I am not in politics for fun, frivolity or to amass wealth, I have always been driven by a deep sense of commitment to make a difference to the lives of our people. “After my retirement from the army, or forceful retirement, I sat back and watched as events unfolded on the political turf, and realised the country needed an intervention for fairness, justice and inclusion of Nigerians in the issues that affect their lives,’’ he said. 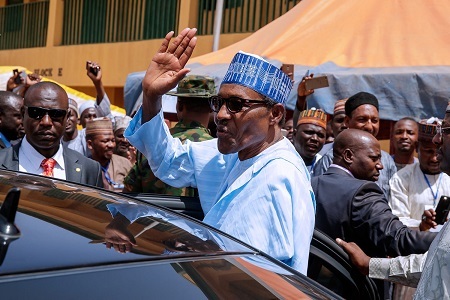 The President called for patience, maturity and orderliness as the 2019 elections’ calendar begins to unfold, urging political parties, candidates and the electorate to put the country first and always remember that victory ultimately belongs to God. “After going to the court so many times to challenge results of elections in 2003, 2007 and 2011, and going up to the Supreme Court, I concluded that ultimately it is God who determines who will win elections, and in 2015 I got here,’’ he added. 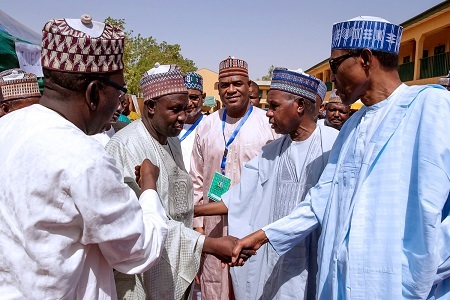 In his remarks, the Katsina State Governor, Alhaji Aminu Masari, said the process of electing the leaders of the party at the ward level was hitch-free, orderly and based on the constitution of the APC. “What we have here are our leaders that were chosen based on consensus and we are happy that it reflects the will of the people and the APC constitution. We followed the process to also ensure that there is affirmation,’’ he said. The Chairman of the Organising Committee for the Ward Congress, who is also the Commissioner of Justice and Attorney General, Ahmad Usman El-Marzuq urged the party leaders to remain loyal and live up to expectations.